The British Museum notes say: "Inumura Daikaku being surprised by a female in his hermitage." Perhaps it is his wife Hinakinu. Her appearance drew our attention to the beautifully rendered irori or sunken hearth above which hangs a jizai kagi or hooked contraption that hold pots over hot coals. The steam or smoke rises from the hearth and wafts into the interior garden space behind Masanori. Masanori is one of 8 brothers each imbued with a magical power. Osaka Prints wrote: "The brothers were scattered throughout different parts of Awa province, but were recognizable by their names, peony birthmarks (the mon or crest of the Satomi clan), and rosary beads (or crystals or luminous spheres), each containing a kanji character for the respective eight Confucian virtues..." Masanori's kanji character is rei (礼) representing 'courtesy'. The Princeton Companion to Classical Japanese Literature lists Masanori's trait as 'Service to Elders'. 里見家 < さとみけ > 八犬士 < はっけんし > の一人 犬村大学礼儀 < いぬむらだいかくまさのり > 赤岩一角武遠 < あかいはいつかくたけとふ > が の一子 < いつし > 也始 < はじめ > の名は角太郎 < かくたろう > ?方 < ?かた > の伯父 < おじ > 犬村儀清 < いぬむらのりきよ > が養子 < ようし > となる故 < ゆヘ > 有 < あつ > て返 ? < たまがへし > の里 < さと > に幽居 < ゆうきょ > し犬飼現八 < いぬかひげんはち > に面会 < めんくあい > し父 < ち? > の仂 < あだ > 野猫 < やまねこ > の妖怪 < ようくわい > を殺 < ころ > し大学 < だいか く > と改名 < かいぬい > して現八 < げんはち > と伴 < とも > に犬士 < けんし > を尋 < たづね > 遂 < つひ > に里見 < さとみ > に仕 < つか > ふ. 1) black and white in The Legacy of Japanese Printmaking/Le Rayonnement de l'estampe Japonaise by Barry Till, the Art Gallery of Victoria, 1986, pl. #38. 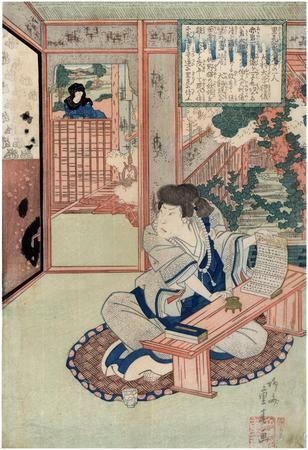 2) color in Ikeda Bunko, Kamigata yakusha-e shūsei (Collected Kamigata Actor Prints), vol. 2, Ikeda Bunko Library, Osaka 1998, no. 168.